The first civilization known to have used the rolling pin was the Etruscans. These people may have migrated from Asia Minor to Northern Italy or may have originated in Italy. They established a group of city states (called Etruria) and were a dominant society by about the ninth century B.C. , but their civilization was cut short after attacks from the Greeks, the growing Roman Empire, and the Gauls (tribes that lived in modern day France). The Etruscans' advanced farming ability, along with a tendency to cultivate many plants and animals never before used as food and turn them into sophisticated recipes, were passed to invading Greeks, Romans, and Western Europeans. Thanks to the Etruscans, these cultures are associated with gourmet cooking. To prepare their inventive foods, the Etruscans also developed a wide range of cooking tools, including the rolling pin. Although written recipes did not exist until the fourth century B.C. , the Etruscans documented their love of food and its preparation in murals, on vases, and on the walls of their tombs. Cooking wares are displayed with pride; rolling pins appear to have been used first to thin-roll pasta that was shaped with cutting wheels. They also used rolling pins to make bread (which they called puls) from the large number of grains they grew. Rolling pins are typically used to smooth out dough. Bethany Housewares Web Page. December 2001. < http://www.bethanyhousewares.com/products10.htm >. Somé, Lucio. "A Salute to the Etruscan Origins of Tuscan Cuisine." Castello Banfi Web Page. December 2001. < http://www.castellobanfi.com/features/story_salute.html >. Koppel, Naomi. "Bright Ideas on Display: Everyday Problems Solved at Inventors' Fair." Cnews Web Page. 13 April 2000. December 2001. < http://www.canoe.ca/CNEWSFeaturesO004/13_inventors.html >. Thank you for this information; it was very interesting. 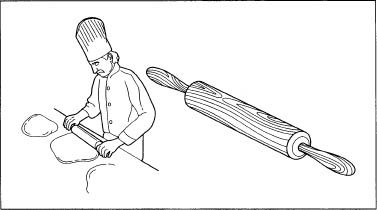 I would be courious to know about the Springerle rolling pin used for cookie making. When was it made, who made it, etc.